(Waldorf, Md., Sept. 12, 2016) - The storied career of Bryant Nelson in the Atlantic League of Professional Baseball continues to be cemented in the record books. The Blue Crabs infielder and 10-year veteran of the league set the new all-time games played record against the New Britain Bees on Monday, September 12, 2016 by playing in his 1,007th game. The record comes a week after he eclipsed the 1,000 games plateau in York, a record only achieved by one other player in Atlantic League history. 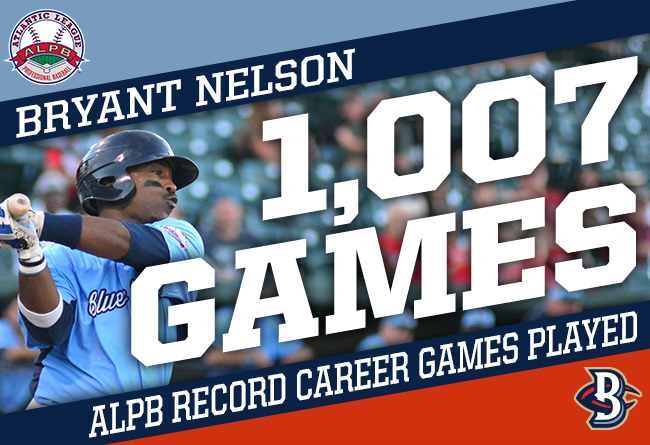 Nelson adds this record to another monumental record set on August 3rd, as he set the all-time base hits record for an ALPB player against Lancaster in Waldorf. The Blue Crabs play 140 regular season games in the Atlantic League of Professional Baseball Clubs. The Blue Crabs play at Regency Furniture Stadium in Waldorf, Maryland with affordable family fun. The franchise opened its ninth season on Thursday April 21st, 2016. Please call 301-638-9788 or visit www.somdbluecrabs.com for more information and to reserve your seat at the ballpark today!